Power has been reconnected to all homes in Wales, more than 48 hours after Storm Doris battered the country. Scottish Power said it reconnected the last of the homes, all on Anglesey, at about 19:00 GMT on Saturday. 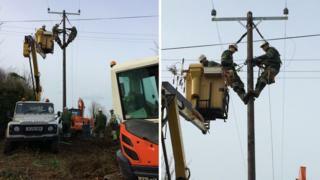 About 600 engineers had been drafted in to restore supplies after 80,000 properties originally suffered power cuts. Vans had provided hot food and drinks to those affected, with breakfast also delivered on Saturday. Scottish Power spokesman Paul Ferguson said there would be plenty of work to do in the long-term to deal with the storm's damage. Meanwhile, Arriva Trains Wales is running a replacement bus service between Llanelli and Shrewsbury on Saturday because of storm damage to trains and overhead wires. The Llandudno to Blaenau Ffestiniog line will be shut until Monday as buses replace trains on an amended timetable. Western Power Distribution worked overnight on Friday to restore power to 240 properties in south and west Wales, 157 in Pembrokeshire and 83 in Powys. On Thursday, Storm Doris caused damage and affected travel and power supplies across Wales. Wales recorded the strongest gust of wind in the UK as the weather station at Capel Curig in Snowdonia peaked at 94mph (151km/h). North Wales was worst affected by the storm and North Wales Police received about 500 more calls than usual.